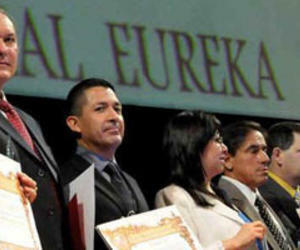 Four Cubans were awarded in four of the five categories of the Eureka Science Prize, during the inaugural gala of Cubamotricidad 2012, which was held in the theater Lazaro Peña, in this city. These awards, given by the World Council of Academic Scholars and Researchers in Education (COMAU), recognize political, educational and researching work, and the best use of its human and professional practices . Alberto Juantorena, vice president of the National Institute of Sports , Physical Education and Recreation (INDER), and journalist Aurelio Prieto were honored , in the categories of Personality of Knowledge and Sciences and Publications and Information, respectively . The Latin American Reference Center for Special Education was awarded in the category of Leading Organizations, while INDER´s Project for Life received the honors in the Researching Projects Diamonds of Sciences category. Dr. Eva Hernandez, from Honduras, deserved the COMAU 2012 Medal of Honor, for her outstanding work on behalf of women and children in her country and for his commendable work towards diversity. Hernandez, also a candidate to the presidential elections in her country, dedicated her award to Cuba and women all around the world, and she added: "women are called to make great changes in the world". INDER presented a certificate of recognition to a group of outstanding teachers for their contribution to physical education and to the development of motor functions inCuban children. Renowned experts and scholars from over 40 countries, including Cuba, will give lectures tomorrow, on the second day of the event underway at the Havana’s Conventions Center. The International Workshop on Physical Activity and Quality of Life, the III Iberoamerican and Caribbean Summit on Physical Education and Sports School, and the International Symposium of Recreation take place at the same time that Cubamotricidad 2012.